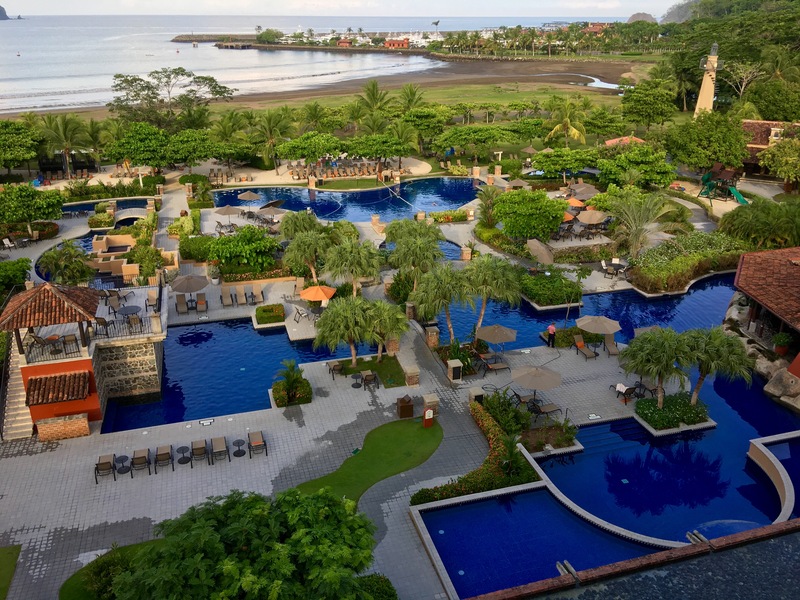 At first we had planned to stay in San Jose for the two nights but then Brad found the Marriott Los Suenos and after seeing the pool we couldn't refuse. We weren't there to explore and do day trips, we just needed somewhere to stay where we could enjoy the sun. The Marriott was a good 1.5 hour drive from the airport near a beach town called Jaco. We were pre warned that even though the car seemed cheap online they require local insurance in Costa Rica. We were quoted about $60 for the two days but ended up actually paying $220USD for the car. We did opt for the full insurance on top of the required additional insurance, we wanted the luxury to return it with no questions asked. I guess most people are taking these little 4x4's into the bowels of the jungle. We awoke on Sunday to take in the paradise around is. We ran down to our "included in package" breakfast buffet which was great. Caramel sauce is fantastic on French Toast BTW. We ate up and made it to the pool while the sun was out, it was about 27 degrees but felt warmer. Most likely the reason for the seat sale in the first place was that it is low and rainy season so we were lucky to have sun until about 2pm. The pool was amazing, the water was warm and they had a swim up bar. Who can complain? We did explore around the beach but the resort isn't known for the beach so we stuck to the pool. The beach was black sand and seemed a little rocky. I did hear people comment that the water was very warm also. We headed to Jaco for lunch at a well reviewed sandwich place. It was delicious and it was good to see the town and get out of our "resort bubble". Monday morning our trip was already coming to an end. After our second free breakfast we hit the road back to San Jose. The drive was easy between the resort and the city, nicely paved roads, lots of passing lanes and in the daylight a great view. We made sure we had time to stop at one of the five Starbucks in Costa Rica to get a collector mug of course. After dropping off the rental car we headed to the airport. Good thing we went early! The airport wasn't busy to check-in but security was literally out the door. We went through the line to get to passport check and the agent said we actually had fast track and could have skipped the line! We didn't realize we didn't have to wait and he walked is over to the quick security line. It would have been nice if the agent at Copa told us that but I guess we could have seen on our boarding pass ourselves. Plus there was no one directing people or signage so we didn't know. At least we got to skip the 30+ minute security line. The flight home was uneventful, which is always good. If you do fly Copa, get the bulk head seats (we were on a Embraer and a 737). Lots of leg room and your bag can still slip under the seat in front, plus there is no additional charge to pick up those seats! We'll definitely return to Costa Rica to explore some more. There is lots to see and I definitely want to see what the country has to offer especially if we can get a cheap flight and status miles. - Copa actually serves a snack on the 1 hour flight between Panama City and San Jose, CR. They barely had time to serve them all + drinks before it was time to land. - Be warned that if you choose the exit row seating on Copa, they *may* move you if you don't speak Spanish. Chances are you will be okay when leaving from the Canada or US, but it may be an issue if flying between two Spanish speaking countries. - San Jose airport just started screening for liquids, and they are super vigilant. Not only do they enforce the 100ml rule (which is common), but the plastic bag cannot be larger than 1 liter (even if the liquids in the bag don't come close to totaling that amount). I've never seen a North American airport enforce the size of the plastic bag.